As a doula, I have more than a few tricks up my sleeve. I have my doula bag that goes with me to all births loaded with massage tools and other various tools for comforting a mother during labor, but I also have what I call my Mommy Bag of Tricks. In it is the collective experience of motherhood from myself and my friends as well as actual practical items like baby slings, parenting books, favorite products, etc. Though I spend the majority of my time coaching pregnant women about how to stay healthy before birth and educating them about their options in childbirth, I am also the person they call as new parents when they encounter various difficulties. One of those is how to soothe colicky babies. Often colic, or inconsolable fussiness in newborns, can be related to indigestion or acid reflux. A lot of times it can be treated with physical changes like better burping, keeping baby upright after feedings, changes in mother's diet if she's breastfeeding, or switching formulas if she is bottle feeding. Sometimes, when all other options are exhausted, parents need more help and often turn to friends and physicians to see if there may be a medical or chemical component they're unaware of. One of my recent doula clients contacted me when she felt like she was at her wit's end with her newborn. This sweet baby seemed to have the worst case of colic and acid reflux I had seen in a long time. She was even unresponsive to prescription medication. Before turning to prescriptions though, there are tried and true natural remedies that can offer substantial relief to babies suffering from colic due to indigestion. One of them is Gripe Water. This simple solution includes things like ginger, which, even for adults, is an extremely effective remedy for stomach troubles. I suggested Mommy's Bliss Baby Care Gripe Water to my client, Courtney, and I'd like you to hear straight from her how amazing the product is! "My sweet little Ava is number three in the lineup. Our previous two children did not have symptoms of colic, were great breastfeeders, and were relatively easy to settle. So we were stumped when at two weeks of age, Ava seemed to cry no matter our many attempts to help her. All we could do was walk and bounce, walk and bounce. We tried everything. We thought that perhaps she was having reflux because she was arching her back and crying after feedings. She was put on a prescription antacid as well as Mylicon drops for gas. I also removed dairy and artificial sweeteners from my diet. Still, we had a very unhappy baby that appeared to be in pain. I didn't want to accept that I had a colicky baby on my hands because I had always heard that Colic was simply an easy way of saying 'your baby is in pain and we don't know why.' No Mommy I know watches their child struggle in pain without attempting to help in some way. That's when a friend suggested Gripe Water. 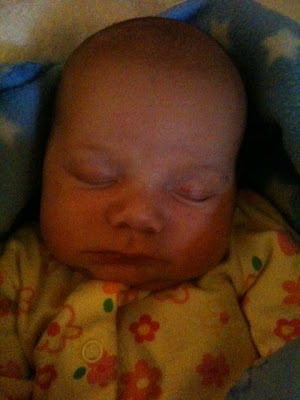 Once we started giving Ava Gripe Water, her hiccups went away almost immediately after giving her the first dose. She was finally able to pass gas and have a bowel movement with minimal discomfort. The dropper is easy to use, although it takes some getting used to. Mommy's Bliss smells and tastes pleasant and Ava didn't seem to mind it at all. It also doesn't have to be refrigerated which makes it easy to take with you on outings. The biggest advantage is that we were able to take Ava completely off of all medications and I have been able to resume eating dairy products. 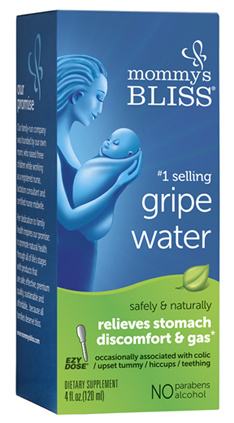 While some children benefit from both, I believe that Gripe Water was just what we needed all along. Mommy's Bliss Gripe Water is an excellent product-all natural & fast acting, and we now have a much happier baby!" I really like minimizing unnecessary medications and chemicals for myself and my children, which is why I promote healthy living and natural care products. Mommy's Bliss is definitely one of those products. "Mommy's Bliss, a provider of safe, effective and natural premium-quality products for families, soothes tiny tots' rumbly tummies with its Gripe Water. Ideal for relieving gas and stomach discomfort often associated with colic, hiccups and teething; this all-natural herbal supplement is available in both Original and Apple flavors. Containing no alcohol, chemicals, parabens or artificial flavors, it is 100% vegetarian and vegan; as well as recommended by pediatricians nationwide." Check out the Mommy's Bliss website and their facebook page for more information and special offers on their products. You can also follow them on Twitter to make sure you don't miss their latest news!